Eurovent are the UKs largest manufacturer of enclosed Granulation Suites and have successfully developed a system restricting operator input to a minimum, and by automating the system using security access, repeatability between batch operation is assured. This reduces the possibility of downfall of production, quality and quantity, which, on many occasions, is due to operator error. The W.I.P. System has a number of high efficiency spray balls fitted to the system to cover the maximum contact parts area. The cleaning media normally used is de-ionised water with the option of a detergent dosing system fitted, and operated through the PLC system for maximum control. 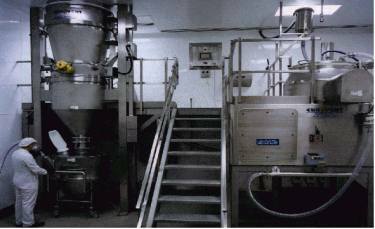 Vacuum Transfer Systems are now widely used with Tablet Press and Blending to provide a powder free environment within the Granulation Area. The system works by applying vacuum through filters directly into the Granulator using FDA approved clear tubing with an anti-static coating giving easy dismantling for washing purposes. 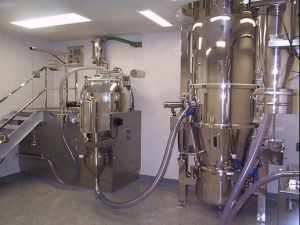 After granulation the product can be transferred through an enclosed vacuum line to a Eurovent Fluid Bed Dryer. Complete containment is ensured by an automatic discharge system. Mills and other ancillary equipment can also be incorporated into the system.